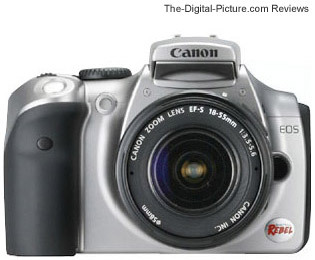 Note: The Canon EOS 300D Digital Rebel has been replaced by the Canon EOS Rebel XT / 350D. Since the Canon Rebel XT has been introduced, the price for the 300D has dropped significantly. When Canon introduced the EOS 10D, we were impressed at how much camera was available for the price. Now Canon has introduced the 300D - at a MUCH lower price. I couldn't resist taking a look at what may be the best digital SLR camera value going. My review will primarily focus on comparing the 300D to the Canon EOS 10D as that is what I am currently using - and what the Digital Rebel most closely relates to. The most obvious differences are the size, weight, price and color. The 300D is significantly smaller and lighter than the 10D. It seems (to me) to balance best with the lighter lenses. With the 18-55mm kit lens installed, this is a very small DSLR. One benefit is that it requires less effort to take with you. The downside to the weight issue is that the body is plastic. Plastic (vs. magnesium) results in a less rugged design and a cheaper feel. I think everyone would agree that the Digital Rebel wins in the price category - by a wide margin! The silver vs. black color issue is simply a personal preference - I prefer black. A slightly less noticeable difference is the Digital Rebel's lack of FEC (Flash Exposure Control). The 300D does not allow the built-in flash or the Canon 420EX Flash to be exposure compensated. The Canon 550EX has its own FEC control - but at a higher purchase price. The relatively large 550EX does not balance well on the light Digital Rebel. Also, because the Digital Rebel is missing a PC Synch Terminal, workarounds are required to use studio lighting. The 300D's built-in flash raises higher than the 10D's. This helps the flash fire over/above a greater list of EF lenses - fewer black half moons in your shots. Moving the flash farther from the camera usually results in less red-eye and generally better pictures. The Digital Rebel has an infra-red remote available for it. I prefer the infra-red remote to the standard tethered Canon RS-80N3 Remote Switch. It is much more convenient for me. The 300D's status LCD is located on the back - the Canon 10D's is on the top. I don't know which I prefer - they both work fine. The mode dial on the 300D is on the top right vs. top left for the 10D. I like the 10D's round back dial much better than the 300D's buttons. The 1.6x field of view crop factor means that the outer 40% (approx) of a standard EF lens is not used. Starting with the 300D, Canon is making an EF-S lens available. The EF-S lens basically omits the unsed portion of an EF lens - and is currently only compatible with the Digital Rebel. The Digital Rebel is missing some of the 10D's autofocus and exposure control in the creative modes. These (in my opinion) are some of the biggest disadvantages of the 300D. Also missing are the Canon 10D's custom functions. The EOS 300D uses a pentamirror instead of a pentaprism. The advantage of a pentamirror is lighter weight and lower cost. The disadvantage is slightly more light loss in the viewfinder. The 300D's shutter is somewhat louder than the Canon 10D. Also, the Digital Rebel can shoot 2.5 frames per second for 4 frames in continuous shooting mode compared to the EOS 10D's 3 fps for 9 frames. The Digital Rebel's significant similarities to the Canon EOS 10D include the image sensor, the image processor and Canon EF lens compatibility. The two cameras share some significant similarities. You get the same incredible DiGiC processor handling the same incredible 6.3 megapixel image sensor. All other things being equal, the Digital Rebel should yield the SAME great pictures as the Canon EOS 10D. Keep in mind that some of the default parameters such as sharpness are turned up higher on the 300D. Canon is renowned for its lenses. The Canon EOS 300D Digital Rebel can take advantage of a huge selection of lenses from wide angle to extreme telephoto. The Digital Rebel and 10D also share the same 1.8" LCD review display. The 300D and 10D share the same 1.6x field of view crop factor. Wildlife photographers rejoice, landscape photographers keep waiting.